very good, in excellent order, everything is fine; completely satisfactory; OK. The group Copacetic hails from Columbus, Ohio and formed as a result of friends coming together to help on a gig. They have been performing their mix of Jazz, Gospel and Soul together ever since. Their name “Copacetic” simply means “all is well” or “everything is cool”. That is the goal each time they perform – for those listening to walk away with a great listening experience and feeling that everything is cool, all is well. 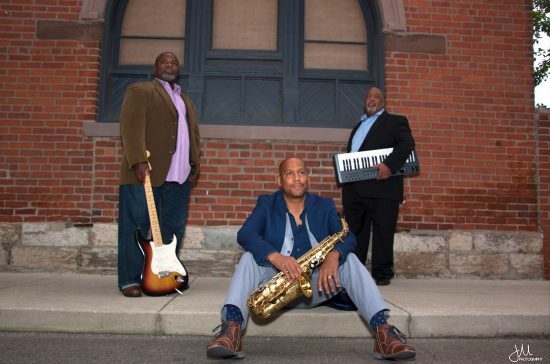 The members of Copacetic are Ed Hill (saxophones), David Jordan (keyboards), and Derek Brown (guitars). And while they have worked together at different times in various other settings, it took some time for the group to be born. Ed and Dave worked together as musicians in their church and initially formed the jazz duo “1+1” in 2009. While working with Las Vegas vocalist Liz Hope on a performance, Ed put together a backing band that included Dave and Derek giving the three their first opportunity to perform together. Their paths crossed again in various settings but in January 2016 Ed invited Dave and Derek to join him on a gig thus forming the trio Copacetic. They have been friends for years and it shows when they play together. They love to have fun when they perform and their audiences have a great time too. Imagine painting a picture with your favorite colors, mixing and blending them until just the right shade and feel. That is what listening to Copacetic is like. A “just-right” sound that is both soothing and exciting to hear. Whether it’s a jazz standard or an instrumental version of a classic soul song, the group’s approach is always a unique mix that’s pleasing to the ear and intriguing to the mind. A special blend of sonic java. Each of the members write and arrange music and the group truly enjoys shaping familiar tunes with their smooth sound as well as contributing original selections to their repertoire. The group released its debut self-titled EP in Summer 2017. Read the JazzColumbus.com review here. Experience Copacetic… Music for the Soul: A Contemporary Mix.